It’s now a month since I cut a selection of bamboo. The process was described in the World Bamboo Day post. The culms were all left upright in their respective groves, propped up off the ground by various means. Some had stones under them, others were held off the ground with bricks or blocks. Some sat quite neatly over, or in, the stump of a freshly cut neighbouring stem of bamboo. After a month of transpiration, this week I removed the cut bamboo from one grove. After a month, the leaves are dry and crisp and brown. The top sections of each culm, where the branches start, are changing colour to yellows and browns. Below the branches, the colour on the lower parts looks to be pretty much the same as when they were cut. Unsurprising, given that this is where most of the moisture is stored. I cut each stem just above the lowest branch and discarded the upper section with all the branches. This sudden influx of bamboo culms has created an urgent need to get creative with storage solutions. 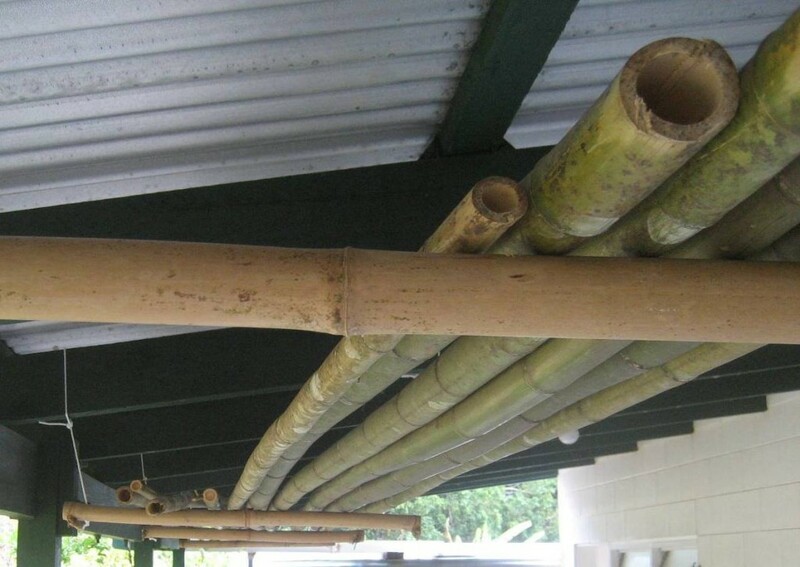 The bamboo needs to be out of the weather, in a covered area, and off the ground. My storage solution? I’m very fond of simple, practical solutions to any challenge or problem. To create an additional area to cure and store the freshly cut, slim and light bamboo culms I used some silver rope and short lengths of bamboo. Like a series of swings or trapezes. This system will be easily expandable. 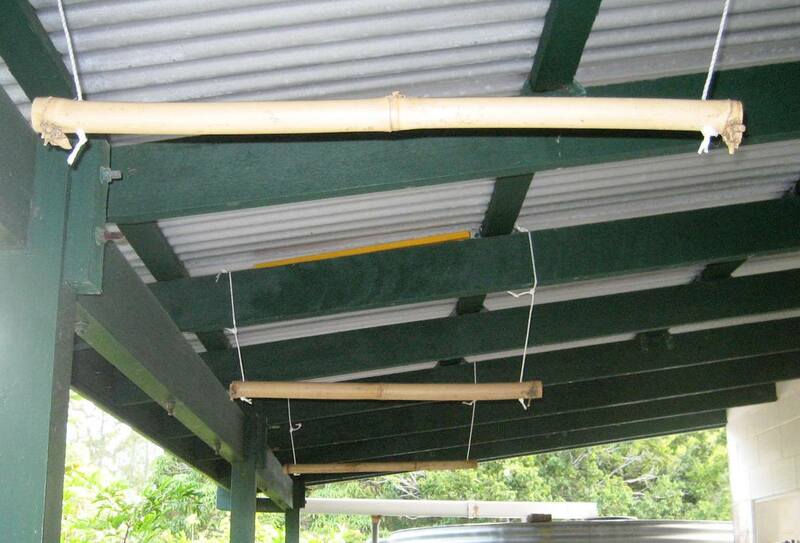 This entry was posted in All, Bamboo in the garden and tagged bamboo, harvesting bamboo, storing bamboo, transpiration on 18/10/2013 by Deb.